How do you compare the stability of two or more compounds which differ in some central atom(s)? If you simply calculate the energy of both compounds you get a misleading answer since the number of electrons is different from one to the next -in fact, the answer is not so much misleading as it is erroneous. 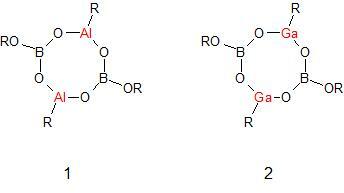 Take compounds 1 and 2 shown in figure 1, for example. Compound 1 was recently synthesized characterized through X-Ray crystallography by my friend Dr. Monica Moya’s group; compound 2 doesn’t exist and we want to know why – or at least know if it is relatively unstable respect to 1. Figure 1. Compound 1 exists but compound 2 is apparently less stable. Is it? The absolute energy difference E1 – E2 is staggering due to the excess of 36 electrons in 2. But after this compensation procedure we now have a more reliable result of ΔE value of ca. 81 kcal/mol in favor of compound 1. In strict sense, we performed geometry optimizations at various stages: first on compound 1 to remove the distorsions due to the crystal field and then on the substituted compound 2 to make sure Ga atoms would find a right fit in the molecule but since their covalent radii are similar, no significant changes in the overall geometry were observed confirming the previous assumption. We now have the value of the energy difference between 1 and 2 and other similar cases, the next step is to find the distal causes of the relative stability which may rely on the bonding properties of the Ga-O bond respect to the Al-O bonds. What do you think? Is there another method you can share for tackling this problem? Please share your thoughts on the comments section.